Collaborate with other medical professionals to optimize the physical activity and wellness of athletes, patients, and clients in sport, work, and life. The application process for the Athletic Training graduate program for the 2020-2021 academic year will open July 1, 2019. The Commission on Accreditation of Athletic Training Education accepted the request for change of degree for the Athletic Training program at Slippery Rock University in September 2017. Slippery Rock University is no longer accepting students into the undergraduate athletic training program. The SRU Class of 2020 will be the last cohort to graduate from the Bachelor of Science in Athletic Training degree. Slippery Rock University of Pennsylvania is accredited by the Commission on Accreditation of Athletic Training Education (CAATE) located at 6850 Austin Center Blvd., Suite 100, Austin, TX 78731-3184. The program will have its next comprehensive review during the 2020-2021 academic year. Athletic Training prepares selected students with the knowledge, skills, and abilities to provide care to athletes and the physically active within the five domains of athletic training practice. In order for students to attain the Board of Certification (BOC) credentials, an individual must complete a professional athletic training education program accredited by CAATE and pass the BOC credentialing exam. To practice legally as an athletic trainer, an individual must hold proper state regulatory credentials. 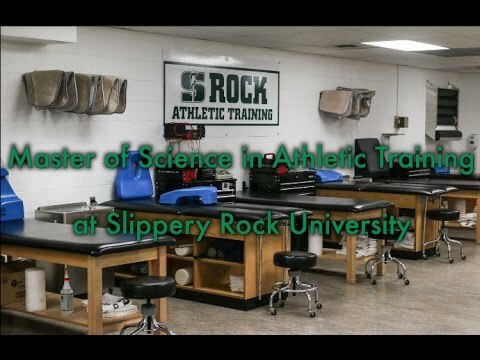 The Athletic Training (AT) Graduate Program at Slippery Rock University is a combination of rigorous academic instruction and authentic clinical experience. The AT Graduate Program will prepare proficient health care practitioners who will collaborate with other medical professionals to optimize the activity and wellness of patients and clients in sport, work, and life. Students will learn the science of athletic training with a focus on patient-centered injury and illness prevention, diagnosis, treatment, rehabilitation, return to activity, and exercise as medicine. The AT Graduate Program is guided by the athletic training education competencies as well as the core program values of professionalism, respect, compassion, interprofessional education, evidence-based practice and student-centered learning. Students will develop communication, decision-making, analytical, and altruistic skills necessary for proficient practice with a diverse population. Students will need to possess select pre-requisite knowledge, emergency care certification, and health and criminal clearances before beginning the program. Students successfully completing the AT Graduate Program are eligible to take the Board of Certification (BOC), Inc. examination. Graduates who pass the BOC examination will be qualified to deliver quality healthcare in various employment settings (e.g. high schools, colleges, professional sports, industrial, military and performing arts), and will contribute to the global medical community by reducing healthcare costs, improving healthcare accessibility, preventing and managing diseases, and promoting wellness. Individuals holding the BOC credential or are eligible to take the BOC certification examination are not candidates for the AT Graduate Program. SRU has built a recognized reputation, not only in western Pennsylvania but throughout the United States in health, wellness and clinical sciences, and has gained recognition for the quality of faculty and program content in many ways. The undergraduate Athletic Training Program, established in 1974, has a history of excellence in the profession of athletic training with alumni across the state, country and world. The university sponsors several health and medical profession programs that engage in interprofessional education and practice. The graduate program is committed to providing diverse, authentic, and immersive clinical experiences. The Exercise is Medicine® initiative is infused in the program values. Beginning July 1, 2019, all applicants should complete an Online Application and Application Fee. Applications will be accepted until all cohort seats are full. Early admission decisions will occur for all applications received by January 15. All applications completed by November 15 will receive priority consideration for admission to the program. Applications will be accepted until the cohort seats are full. Official Transcripts (Undergraduate/Graduate) with a GPA of 3.0 or higher on a 4.0 scale. (Students with a GPA below 3.0 may apply for conditional admission). Evidence of 50 hours of clinical observation/shadowing (AT Clinical Observation Form) with an athletic trainer. A successful interview (the most highly-qualified applicants will be invited for an interview). In addition to meeting the minimum standard admission requirements, applicants must participate in a personal interview with the admissions committee. The most qualified applicants will be contacted via email or phone call after November 15 to be invited for a personal interview. Interviews will occur on campus in December and January. Applicants who are invited for an interview are responsible for the costs incurred for travel, lodging, meals, etc. Individual and group interviews may be conducted by the admissions committee of athletic training faculty. Meeting the minimum admission requirements does not guarantee an interview. The applicants' interview experience will be strongly considered for admission to the athletic training graduate program. For more information on the Athletic Training graduate program, please visit SRU Athletic Training's About the Graduate Program page. Dr. Bonnie Siple, with students Trevor Lotz and Brianna Spencer, talk about transitioning the Athletic Training Education Program from undergraduate to graduate level education. The first Masters Degree cohort class will begin in the summer of 2018. In the AT program at SRU, students learn with hands on experience in a variety of labs, internships, and events at the university.